So the antique centaur hath a savage greatness as well as beauty. The centaur is Sumerian in origin, one of their menagerie of fantastic half-human monsters. Winged and scorpion-tailed, these centaurs were fearsome, semi-divine creatures: with their kin the scorpion-men they guarded the entrance to the ‘underworld’, aiding those on their final journey. We tend to associate centaurs with Greek mythology, but the Greeks transformed them; stripping them of their supernatural character, making them surly, violent, backward creatures, incapable of civilisation. The Centauromachy, a popular theme in Greek art, depicted the defeat of the centaurs by the Lapiths. It symbolised the victory of man over animal nature; of the ‘civilised’ over the ‘primitive’. For Greeks of the classical period the centaur was already a creature of the prehistoric past; endangered if not actually extinct. Despite this more influential view, the older image has resurfaced occasionally. In Virgil’s Aeneid centaurs were still guarding the underworld’s entrance. This tradition was continued by Dante in the Inferno, where centaurs guard the underworld city of Dis. Another survival is found in the constellations of the southern hemisphere, where the Milky Way crosses the ecliptic (not easily seen from these latitudes but a glorious sight for those ‘down-under’). There, flanking the brilliant heart of our galaxy, are Sagittarius and Scorpius – centaur and scorpion. But perhaps the most vivid survival of the old Sumerian monster is contained in the world’s-end vision of the Book of Revelation, where, at the sounding of the fifth trumpet, strange ‘locusts’ emerge from the bottomless pit "like horses prepared unto battle; and on their heads were the faces of men … and the sound of their wings was like the sound of chariots of many horses running to battle. And they had tails like scorpions, and there were stings in their tails". For rationalists of the seventeenth and eighteenth centuries, the centaur became emblematic of an uncontrolled imagination. They believed that the human imagination ran amok unless disciplined by reason: out of its bottomless pit came fearsome monsters, ghosts, chimaeras – nightmares devoid of reality. Reason has to firmly check the power of imagination, lest we live in fear of its fabulous creations. The program of rationalism remains hugely influential, but there has been a counter-movement. Artistically speaking one can call this the Romantic movement, but it is also bound up with the study of mythology and primitive cultures and, in psychology, the ‘discovery’ and exploration of the Unconscious. All support the view that we can never be wholly rational; that rationality is, at best, a rather thin veneer covering a vast underworld of inarticulate instincts and passions, and that ignoring or suppressing what goes on there has many dangers. My centaur stands at the entrance to this underworld. He stands on ground that I feel I need to claim and defend as core territory for my art. Part of my ‘job’ as a painter is to see what I can bring from this underworld and allow to take shape as an image. By doing so, I hope to enlarge the sphere of conscious human experience and keep us in touch with our ‘shadow’ side. For me this painting is also about fatherhood. I’m now the father of three children: one of my sons posed for the child in this picture. At the time, he was so ill that I really did have to consider performing part of the centaur's ancient duty. How could I guide and help my child on his final journey? Luckily, we didn't take that path. 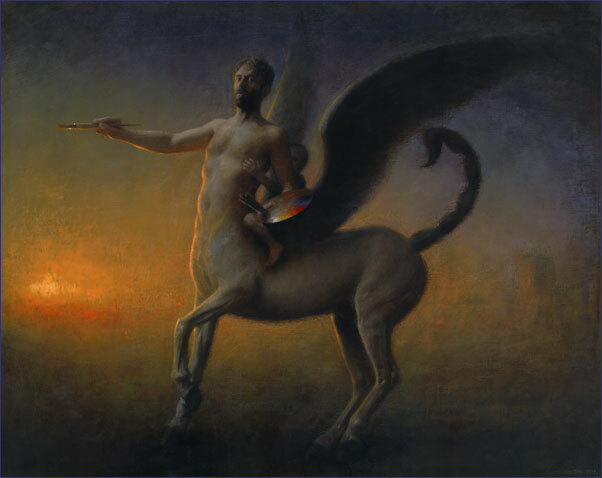 But in painting myself as a centaur I was very conscious of my role as guardian, not just of my childrens' physical well-being, but of their inner lives, their dreams. When I am gone, I hope this painting reminds them that I did more than put food on the table. A centaur catching an antelope. Detail from a cylinder seal of the Middle Assyrian Period.